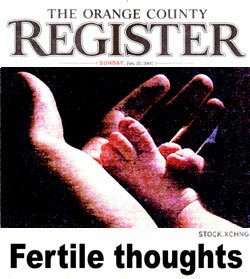 Dr. Lawrence Werlin, a fertility expert and founder of Coastal Fertility Medical Center in Irvine, has launched a blog on the center’s Web site, WerlsFertilityWorld.com. The blog features Werlin’s opinions and advice on a wide range of reproductive health issues. Recent Posts include Werlin’s thought on news of a 67-year-old woman giving birth (at his practice, Werlin says “the cut-off age for treatment is 50 years”), links to news stories about congressional votes on issues related to stem cells and the use of amniotic stem cells as a research tool. The site also promises to encourage “interactive entries” about fertility.